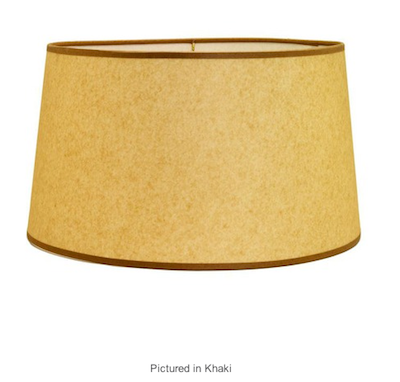 Wayfair’s Linen Shallow Drum Shade (this is the khaki color – it comes in many different colors and my project used a champagne colored shade). 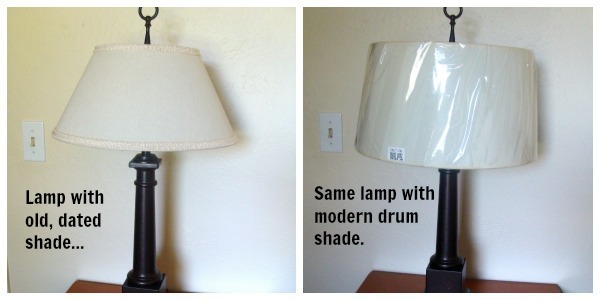 I’ve been wanting to update some of our lamps with drum shades, so this was the perfect opportunity! 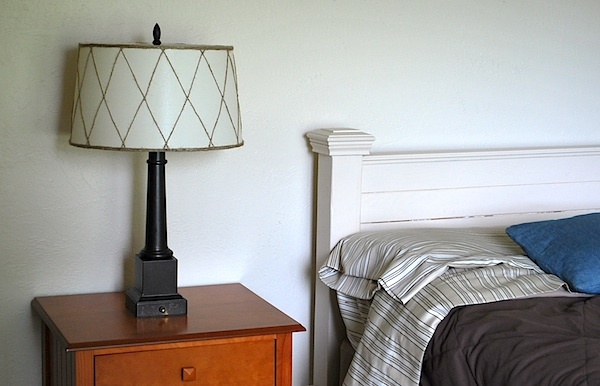 The 16-inch shade fit perfectly on this lamp that was part of our son’s extreme room makeover (the lamp started out as shiny brass – you can see that transformation here). 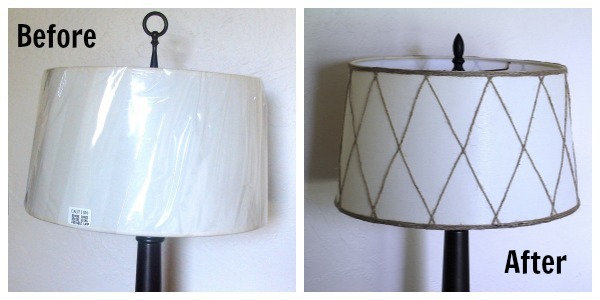 I love how the shade immediately refreshed this old lamp – but I knew I could make it look even better! 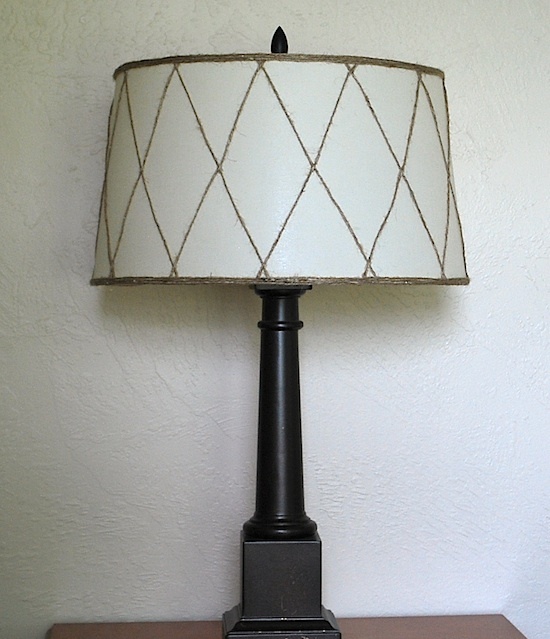 Before starting anything with the shade, however, I noticed that the bright brass wire framing of the shade needed to coordinate better with the oil rubbed bronze lamp. Brown craft paint to the rescue! I used a dry-brush technique to dab on brown craft paint – I wasn’t aiming for perfection or complete coverage, just enough to blend in with the lamp (it’s right at eye-level and is seen from the hall). Then I gathered my supplies for my project – and how simple is this? Glue sticks (so yes, you’ll need a glue gun – is there anyone out there who doesn’t have one?) and natural jute twine. 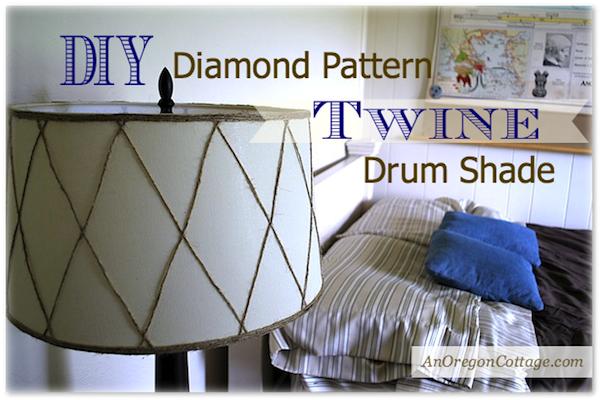 I LOVE how it turned out and how it coordinates with the brown and blue bedroom! Most of our shades are plain, so this is so nice to see every time we walk down the hall – it adds such a finished, decorator look, don’t you think? The only tricky part was getting the pattern to be somewhat uniform – of course you know I wouldn’t sweat aiming for perfection! I decided the main thing was to have all the centers of the diamonds be the same, since that’s what you’re eye is drawn to, I think. Measure the circumference of the shade (this was 16″) and divide as evenly as possible (pretty easy at 4″ for this size) to figure out how far apart the pattern lines should be. In order to make it easy (I thought…) I made a diagonal paper template. Then I used a pencil to trace the lines in one direction. I didn’t need lines in the other – and actually realized I didn’t need lines at all and ended up erasing most of them as I went along! So here’s the easy way (a case of do as I say, not as I do): mark 4″ intervals at the top of the shade and bottom and then mark the center point of the shade at each diagonal imaginary line (just use a pencil to make small marks as guides). You can always draw a light pencil line if that helps you visualize – just be sure to have a good eraser on hand! 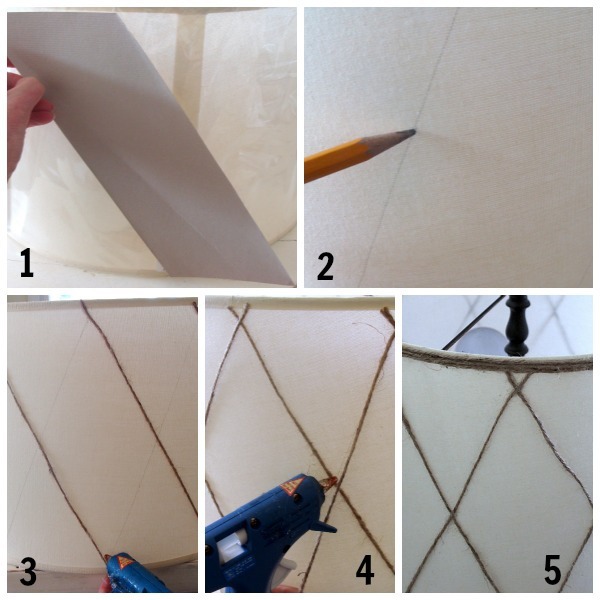 Use the glue gun to attach the twine to a mark on the top (start at the back of the shade) with just a dab of glue, let cool a few seconds and then pull the twine to the next mark on the bottom edge, not the one right below (otherwise that would be a straight line, wouldn’t it?) to create a diagonal line. Picture #3 shows this better – just ignore the lines I made, it’s better not to draw full lines, if you can help it. 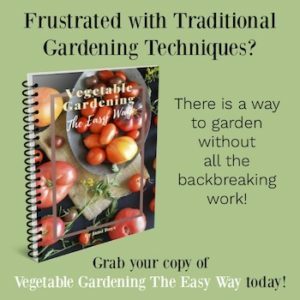 You only need to use a bit of glue at the top, center point, and bottom – otherwise you’ll see a bunch of messy glue along the twine lines. Cut each piece of twine after you’ve finished gluing and move to the next one. 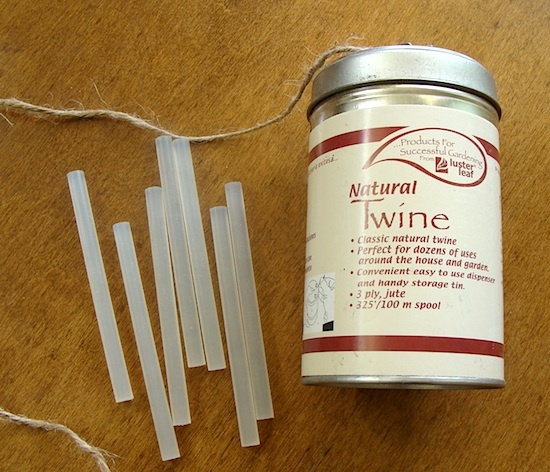 After finishing the twine in one direction, glue the twine in the other direction, adhering and cutting the same way as the first. 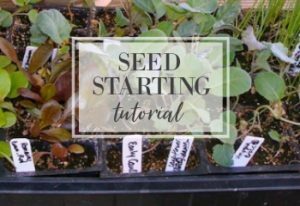 Try not to glue the twine to the very top and bottom edges of the shade – it works better to leave room for the finishing rows, though you can go over the twine if needed (see top of photo #4). Finish the shade with 2 or 3 rows of twine glued to the top and bottom edges, as shown. Try to keep your lines of glue as thin as possible to minimize glue-mess (is that a term?) along the finished twine edges. Ta -da! Isn’t it fantastic? I’m not gonna lie, it didn’t cost much and I wasn’t hard, but it did take me longer than I expected – about 3 hours – so plan that into your project calculations if you decide to transform a shade like this. And the wires? They now blend in much better with the lamp as a whole to anyone walking by. Oh, and notice the other little change I made? The original shade finial was not working for me, so I switched it out with a smaller one that I had. 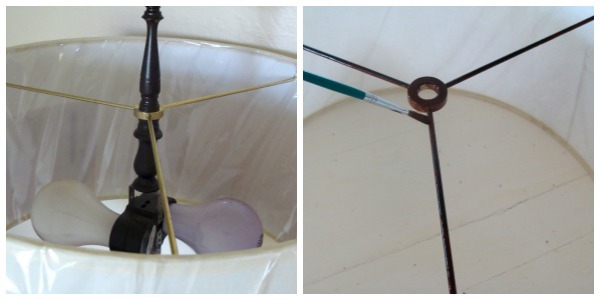 Here’s another look at the before and after – see what I mean about the finial? The smaller one just looks better. I’m totally in love with the finished product – it’s subtle, but I like the texture and the little “wow” it adds to the room! 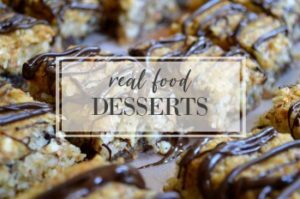 Thank you Wayfair and Hometalk for letting me participate in this fun challenge! Disclosure: I was provided the lampshade and a $25 gift card for supplies to complete this project. All opinions are 100% my own. 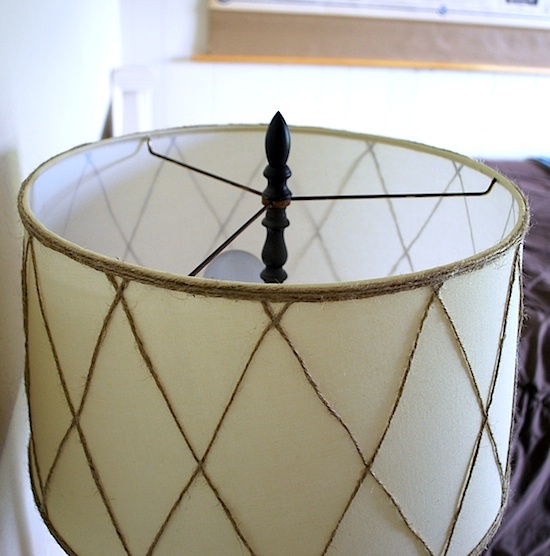 I love how this added texture and dimension to your lamp shade. I have been thinking about doing something similar with ribbon. Great inspiration. Fun, simple, natural (color and twine-LOVE twine!! ), and bright. Great update! Thanks! Sorry I don’t have a glue gun ! But… I may have to get one having seen the lamp shade! Such an excellent idea. Looks reasonably straight forward too.